A good way to understand the role of perceptual maps in competitive marketing strategy is to review the importance of positioning in the Cola Wars era that resulted in the launch of New Coke. Extensive use of Coke-Pepsi blind taste-tests and related advertising. The “Pepsi Generation” advertising program was reinstated by Pepsi in the early 1970’s. This successful promotional campaign promoted the slogans of “The Pepsi Generation’ and “The Choice of a New Generation”. Their image focused TV commercials position the Pepsi as modern, young, innovation and energetic. At the same time, it was designed to reposition Coke in the minds of the consumers as old, tired and boring. The Pepsi Challenge was built around a series of blind taste test with consumers, which means that consumers didn’t know which soft drink they were tasting. These Pepsi Challenge taste tests were filmed and repackaged as a form of reality advertising, primarily focusing on loyal Coke drinkers suddenly realizing that Pepsi tasted better. Over time, Pepsi produced over 300 of these TV commercials for the American market. The final component in Pepsi’s repositioning of the Coke brand was the signing of Michael Jackson to make, initially, two TV commercials promoting Pepsi. This was in the era when Michael had just released his Thriller album, which would go on to become the biggest selling album of all time. In other words, he was a superstar t the time with strong appeal to the youth market. This dovetailed beautifully with Pepsi’s desired brand image of a young, exciting, dynamic soft drink, as opposed to old boring Coke. 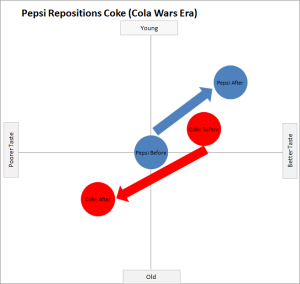 Pepsi’s repositioning of Coke is demonstrated in the following perceptual map, which has been produced using the free Excel template available on this site. As you can see, Pepsi saw an opportunity to reposition both their Pepsi brand and to reposition Coca-Cola at the same time. Their promotional campaigns centered on image and taste demonstrated to the marketplace that they had a better tasting product and a brand that was more attuned to a younger, more modern consumer. Therefore, in the consumer’s mind, Coca-Cola becomes repositioned as having a poor taste and being seen as old people and outdated. 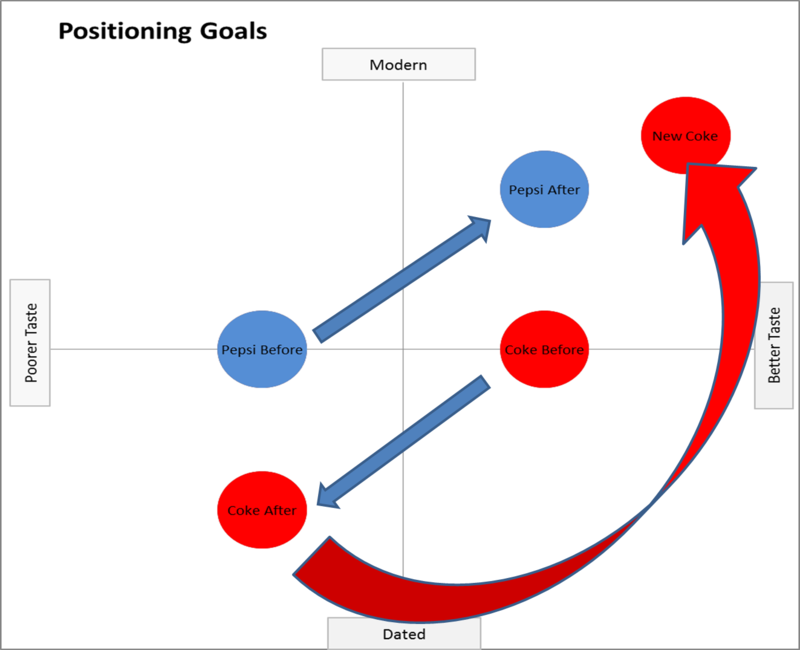 This successful repositioning of Pepsi versus Coca-Cola was one of the main reasons that Pepsi became the preferred brand in the “freedom of choice” retail channels (such as, supermarkets and grocery stores) and why they consistently closed the market share gap during the early 1980s. Please see the article on the New Coke product and how Coca-Cola attempted to reposition Pepsi through a new product introduction.